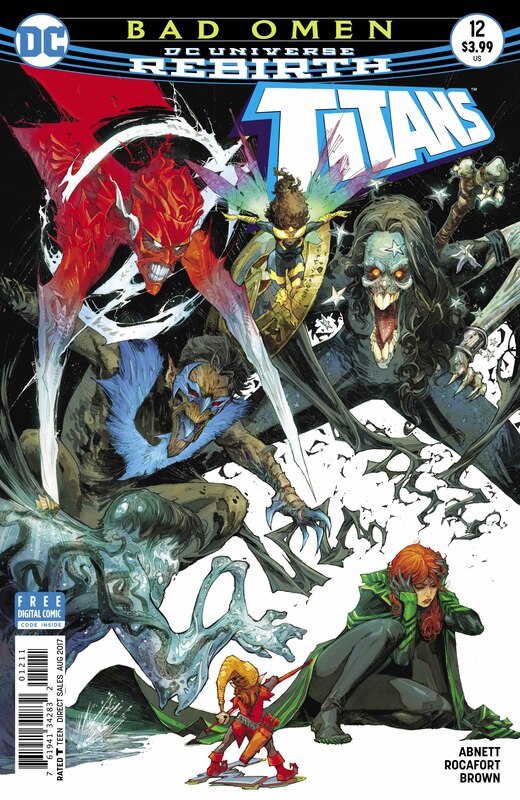 Titans #12 sets up the pieces on the board for what promises to be a thrilling new arc and excels at examining the many personal issues facing the team. 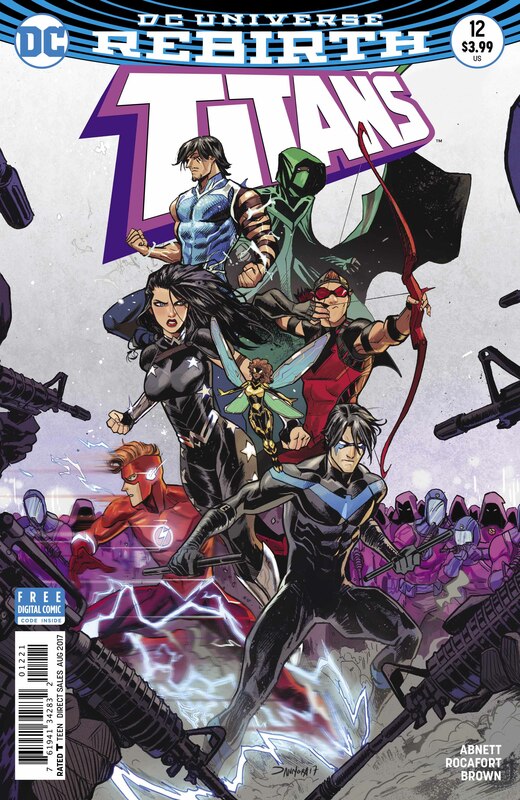 Following on from the recent ‘The Lazarus Contract’ storyline, Titans #12 sees DC’s superhero team in disarray, with each of the Titans still coming to terms with recent traumatic events. As such, this issue is more about establishing where the characters currently stand rather than hitting the ground running with the new arc. That said, it does set up some super exciting developments to be explored down the line. 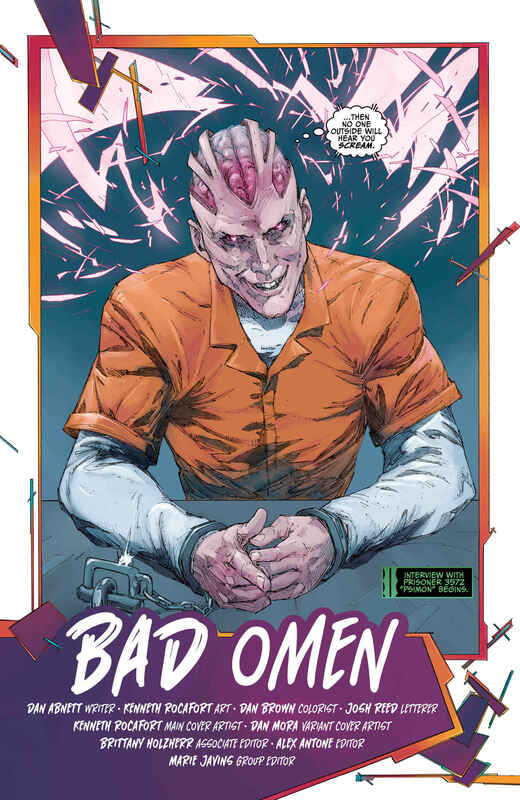 Titans #12 kicks off an arc titled ‘Bad Omen,’ with this part one seeing Lilith Clay AKA Omen visit psionic supervillain Psimon at Rikers Island in order to get some important information. Unfortunately, their mind-melding contest seemingly doesn’t go as planned and Psimon ends up browsing through Lilith’s recent memories. It’s a nifty framework narrative as it ensures that there’s some tension and drama to keep things moving forward while also allowing the issue to be the patchwork of vignettes it needs to be in order to highlight the various members of the team and get across where each of them stand. 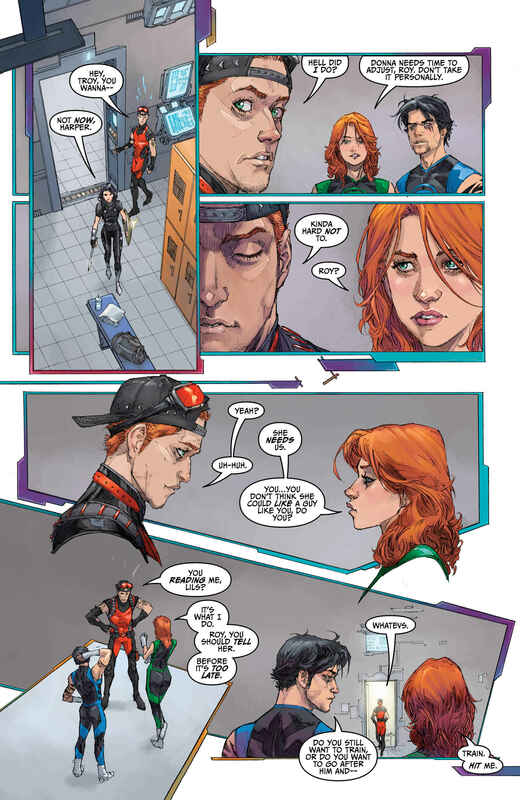 Speaking of which, writer Dan Abnett does a good job at outlining how each of the Titans are dealing with their own issues, often with just a few panels of a single page to do it in. 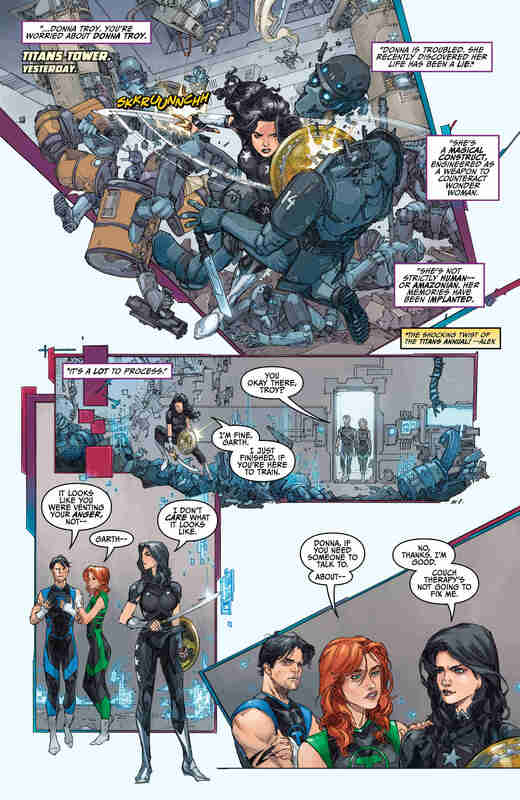 Donna Troy is still struggling with the news about her true origins. Bumblebee is missing her memories. Arsenal is holding back some feelings he should probably share and so on. The only one we don’t get much from is surprisingly Nightwing, but there are seeds sown that some of the team are wary of him since he made a deal with Deathstroke. There’s also some classic Teen Titans romantic drama to be had as well. A warning to old school fans, however: A new relationship is brewing that will probably raise a few eyebrows. How and if readers take to this pairing will be interesting to see. Kenneth Rocafort takes over art duties this issue and, while his style might not be to everyone’s tastes, he does a solid job. 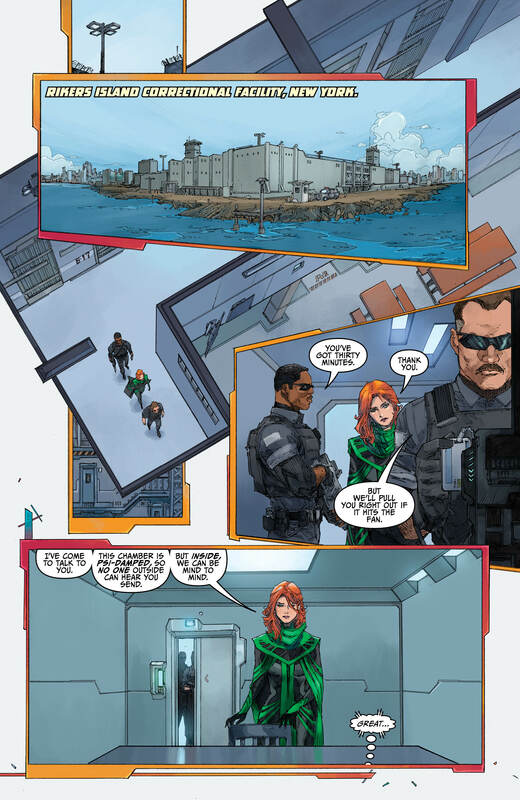 Rocafort’s art is more expressionistic than the work of previous artists who have worked on the series so far. With its heavy use of cross-hatching, for example, it sharply contrasts with, say, the big, bold style of artist Brett Booth and inker Norm Rapmund from Titans #11. 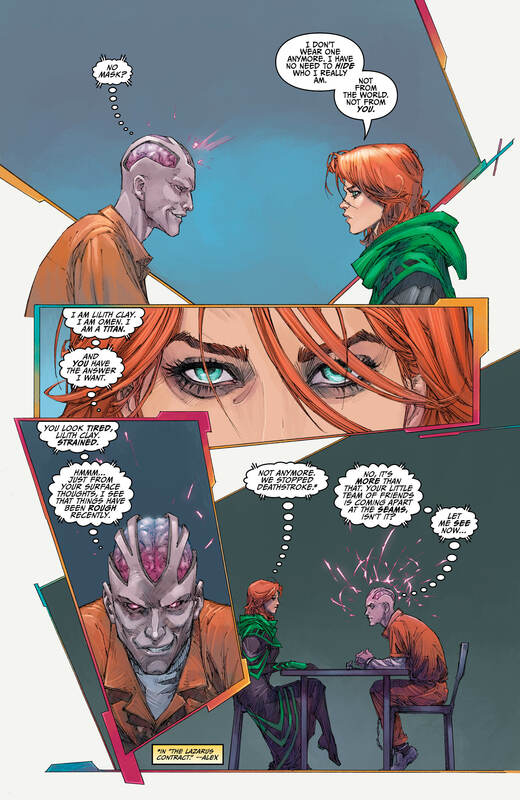 Still, there are some inventive page layouts to liven up the scenes of Lilith and Psimon talking and Rocafort excels at both a splash panel that contains a key revelation and the final full team shot that ends the issue. There’s some nice color work from Dan Brown, too, although there’s quite a lot of white space. Overall, Titans #12 is a necessary change of track after the recent big event crossover. Though it’s mostly about setting the pieces up on the board for a new story arc, the drama increases as the issue goes along and by the end you won’t be able to wait until the next outing arrives to see how it all develops.